What is Smart Future Cities Conference? 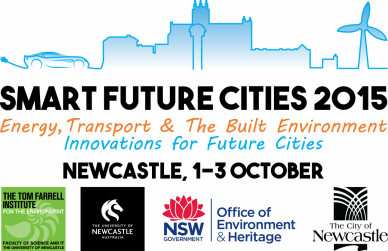 The Smart Future Cities 2015 (SFC2015) Conference will be held at the Newcastle City Hall on the 1-2 October 2015 with a Clean Energy Expo and Electric Vehicle Show on Saturday 3 Oct 2015. The conference is an initiative of the Tom Farrell Institute for the Environment at the University of Newcastle in partnership with the Regional Clean Energy Program of NSW Office of Environment and Heritage and The City of Newcastle. The program will include an extensive range of topics with Keynote Presenters, Concurrent Sessions, Case Studies, Workshops and Poster Presentations. The Smart Future Cities conference will be held at Newcastle City Hall, one of the Hunter Region's largest and most prestigious venues. Located in the heart of the Cultural Precinct opposite Civic Park and adjacent to the Civic Theatre, Newcastle City Hall is within close proximity to public transport, accommodation, the CBD, Honeysuckle and parking.